Along with the vivid and engaging setting, the characters and relatable and interesting. For example, Verity Gallant is the kind of person who is not self-centered when help is needed. She is in a competition and when a great conflict occurs, instead of trying to win, she helps the people who are in danger. Not only does Verity help the others, but her friends are pitching in too. In addition, she and her friends and her are have differences, but when it come to helping Wellow they worked together as a team. All the characters have mixed personalities which make them unique and interesting. This story is great for everyone it has thrills , action, mystery ....... it creates suspense because you never know what will be discovered next. A memorable quotes are, "It was a scene like a nightmare" and "We have to help" The engaging words create suspense which makes sure the reader never wants to stop reading. I always wanted to know what would happen next . 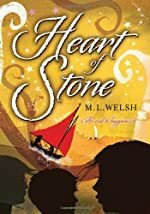 The Heart of Stone deserves 5 stars because I learned life is like a rollercoaster; you never know what comes next, so always be prepared. Very nice review, keep it coming.